The breakout space scheme for our Oxford office design commercial project has been installed! The finished space sees the vibrant colours of the scheme come to life! The flexible seating creates formal and informal seating areas with a table area to further provides space to chat or work depending on the staff’s needs. 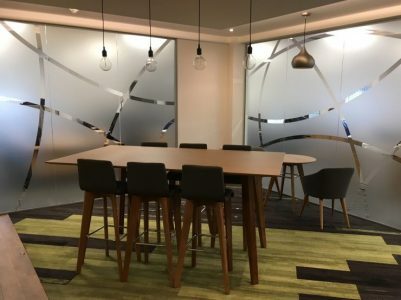 We were approached by a growing business who is expanding and opening a new head office in Oxford. See our portfolio page Office Breakout Space for more information on the concept scheme we created. The challenge with this office space was working with the large open plan space to create a cohesive flexible office space. A key part of the brief was that the scheme could be implemented in phases, to allow the business to successfully move into the new space with no transitional/logistic delays. 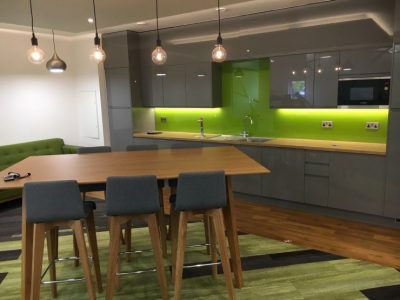 The breakout space within the office, is a main hub area for all staff to congregate, chill and take some time out. 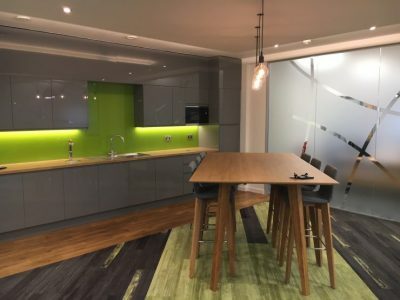 The relatively small space needs to provide a mix of functions, including a kitchen, casual seating areas, a meeting table and some informal work space.